Mr. Smart Mouse, Elizabeth, and I were recently provided free admission into some Espace Pour La Vie attractions during our visit to Montreal. This is an honest review based on our own experiences while there. This was our first trip to Montreal and I did lots of research (big surprise, huh?) on what to visit during our trip. Several of the Espace Pour La Vie (Space for Life) venues kept appearing on best-of-Montreal lists. Obviously we had to add it to our itinerary, and I’m so glad we did! Getting to Espace Pour La Vie was very easy for our group of kid, parents, and grandparents via the Metro (which is a clean, easy-to-use subway system in the city). Need more specific directions? This will provide all the information you need. What is Espace Pour La Vie? 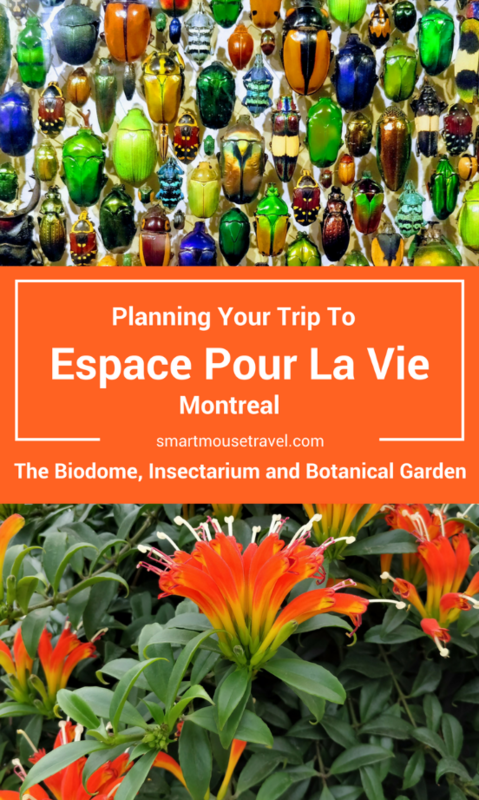 We visited the Biodome, Insectarium and Botanical Garden during our day at Espace Pour La Vie. Find out what we saw at each venue and also my top tips for a visit. I beg you, please learn from my mistakes to make your day even better than ours (which was pretty darn good)! The Biodome consists of 5 different ecosystems located within one large building. We loved how as you entered into each ecosystem you really felt like you were there walking through a place, not just an exhibit. The Biodome treats each area like the real ecosystem it mimics. For example, in the Laurentian Maple Forest area the temperature ranges and amount of daylight fluctuate throughout the day and also season to reflect those actually seen in the forest. Tropical Rainforest – The tropical rainforest was a huge hit with all 3 generations in our group. In here we were able to see beautiful tropical birds, lush plant life, and my favorite – the two toed sloth. Be warned – it is (not surprisingly) hot and humid in there! It was so humid that my camera lens kept getting foggy from condensation. Laurentian Maple Forest – This area is based upon one of the most beautiful forests found in Quebec. We were so fortunate to find it was otter feeding time! The playful otters swimming and eating were a big hit not just with us, but many of the visitors who crowded up to the railing to watch. A beaver also swam lazily around for us to admire his sleek coat and large tail. The beautiful lynx were also one of our favorite animal spottings in the Laurentian Maple Forest. Gulf of St. Lawrence – This ecosystem is actually two areas: an underwater viewing area and walkway where you can admire a marsh, rocky cliffs, and the gulf from above. When we continued up the path to ground level we were able to see (replica) bird eggs hidden among the rocky cliff areas and also look over the tank we had seen from below. Labrador Coast – This ecosystem was a small area just before reaching the Sub-Antarctic Islands. Our favorite sight here were the adorable puffins. Sub-Antarctic Islands – This is the final ecosystem found within the Biodome. 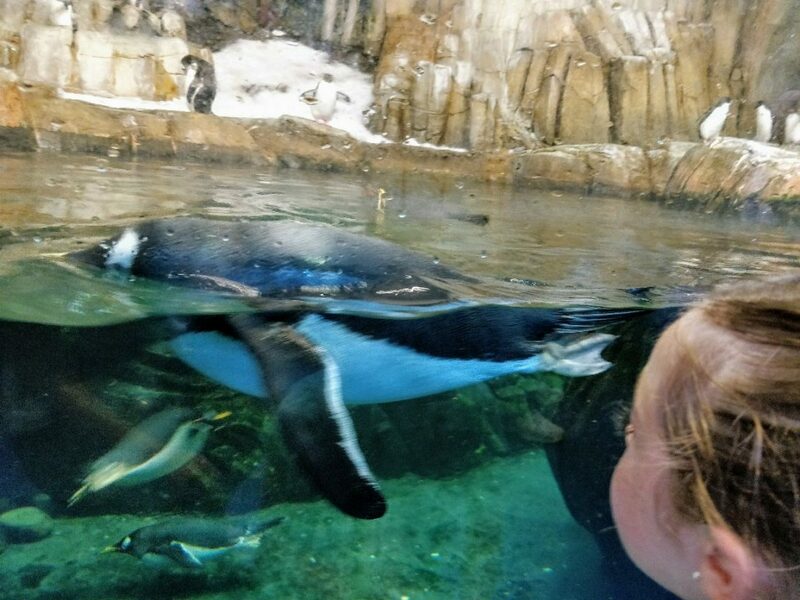 Consisting of a large tank with above and below water viewing the many species of penguins put on a great show for those visiting. We had a seat on the tiered benches and just watched the penguins swim and play for quite some time before we decided it was time for lunch! I was a bit skeptical about visiting a large building full of insects and arthropods (especial since I am a big baby around bugs). However, we spent much more time in the Insectarium than I would have imagined! 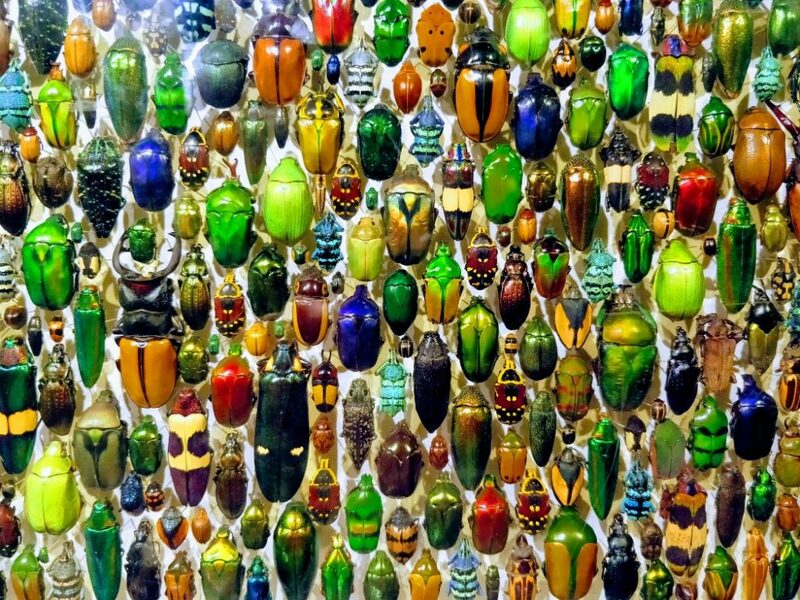 There are two floors of live and preserved insect specimens inside the Insectarium. Viewing the cases of preserved insects and live ones in terrariums was different from what I had expected. There was a stunning display of different beetles in jewel tones on the main level. I couldn’t believe how beautiful beetle shells could be! Also found on the main level is an open air display of live Leafcutter ants (Atta ants exhibit). You can watch the ants working near the anthill and also see them walk across to where a plant is growing. Watching the ants cut large leaves down and then bring them back to the anthill section was fascinating. There are even cameras and video screens to magnify some of the ants as they bustle about. Another favorite spot was the education room located on the lower level. Educational presentations are given in the room in either French or English (check times for your preferred language once you are at the Insectarium). We missed the show, but were able to rest and watch a screen with tons of fun facts about bugs. One thing we learned was how to estimate the outdoor temperature by counting cricket chirps – it really works! Located in and around the Insectarium were Insect Cafes (and a vending machine) where, you guessed it, you could munch on some bugs if you got hungry during your visit. None of our group was brave enough to try, but we saw other daring souls go for it! Just outside of the Insectarium is The BuzzGround (a playground, outdoor learning and picnic area). We still had the Botanical Gardens ahead of us, so Elizabeth did not explore this area. When researching Espace Pour La Vie I somehow missed the fact that the Botanical Garden is 75 hectares (about 150 acres)! The Botanical Garden encompasses 10 greenhouses, 30 themed gardens and a gigantic arboretum. It is beautiful and immense! This was the largest, most extensive collection of plants we have ever experienced at a botanic garden. Depending on the time of year different flowers and plants will be in bloom. I highly recommend you go to the Botanical Garden website before visiting. This website can help you find out the best gardens to visit based on the month you are there. We loved how one garden flowed into the next without any abrupt end or beginning. The meandering walking paths winding through many of the gardens invited you to enjoy the journey. Many people sat in fields enjoying the beautiful day during our visit. There are also benches sprinkled throughout the Botanic Garden for you to rest and enjoy nature. 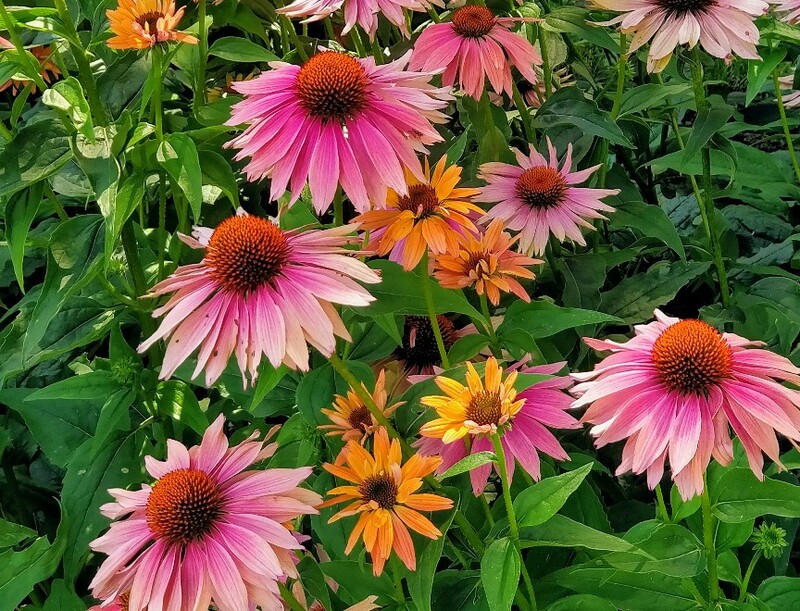 Our group loved the riotous colors at the Garden of Innovation, learning about common dangerous plants in the Toxic Plants Garden, walking through the Japanese Garden, and the main greenhouse (especially the Arid Regions and Begoniaceae and Gesneriads Greenhouse). Allow yourself a full day at Espace Pour La Vie, if possible. I had only allotted 5 hours and we could have easily stayed longer. You cannot purchase regular bottled water at any Espace Pour La Vie facility. Instead they encourage reusable bottles while on site. We found free water stations at both Sol Resto (Biodome) and the Botanical Garden Restaurant (Botanical Garden). Espace Pour La Vie is a lot bigger than I thought. Wear comfortable shoes and clothing. 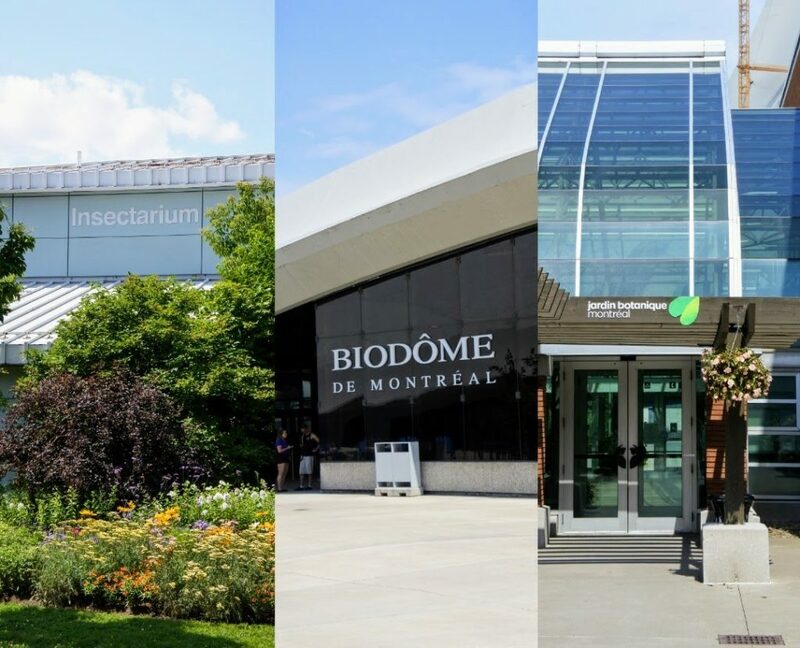 Use the free shuttle to get from the Biodome to the Insectarium. We opted to walk (which provided plenty of pretty views of greenspace and The Montreal Tower), but the walk was more strenuous than I expected. I wish we had waited for a shuttle. Bring a small foldable picnic blanket like my Matador one (affiliate link: buy it on Amazon). We saw tons of people enjoying the beautiful views while relaxing in the shade. Remember sunglasses, sunscreen and bug repellent (for those like me who always get bitten) if wandering the Botanical Gardens in summer. Everyone in our 3-generation group found something to love at the Biodome, Insectarium and Botanical Garden. Our time there went much too quickly! I now understand why so many of the Espace Pour La Vie venues are on best-of-Montreal lists – it will certainly be on mine! This sounds really cool. My kids love places like this where they can learn alot! I really want to get to Montreal. I think its only a 6 hour drive! You should go! We loved staying in Old Montreal – beautiful architecture, so quiet, so clean. The Metro system is amazing for exploring the whole city.